I can’t imagine celebrating Cinco de Mayo weekend or enjoying a good Mexican meal without margaritas. My favorite margarita is the classic tequila/Triple Sec/lime juice concoction on the rocks with a bit of salt on the rim, but I’m always up for trying new varieties. 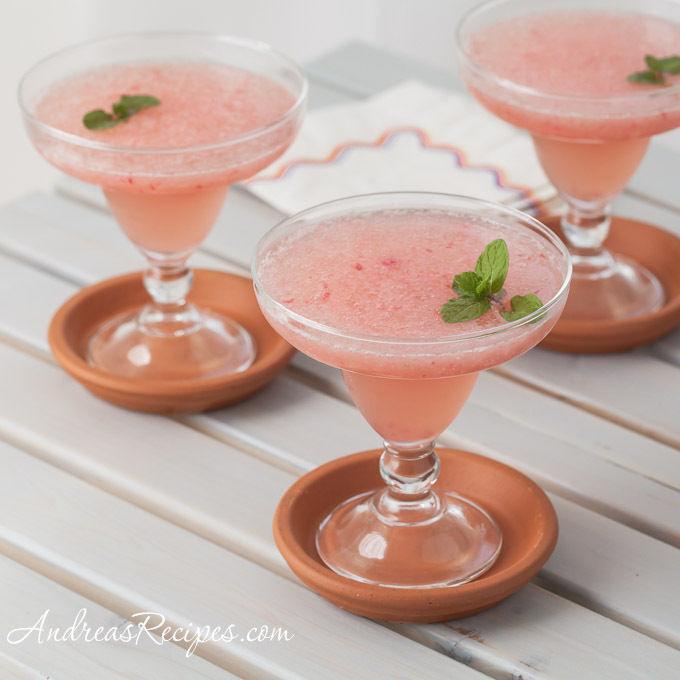 This rhubarb margarita from 101 Margaritas by Kim Haasarud intrigued me, especially since we just added three rhubarb plants to our garden and I’m eager to cook with them. Unfortunately they aren’t ready yet, but rhubarb is coming in season and can be found in grocery stores and farmers markets around the country. The flavor is pleasantly tart and sweet, not overwhelming, and the color will vary depending on the type of rhubarb used. We found it very enjoyable and look forward to making some again with our own homegrown rhubarb. The original recipe makes one serving and I revised it to make four servings, enough to get a party started. Adapted from 101 Margaritas, by Kim Haasarud. SYRUP: Pour the sugar and water into the sauce pan and cook over medium heat until the mixture just starts to boil and the sugar dissolves. Turn off the heat. Allow to cool, then pour into a jar to save for other cocktails. 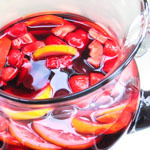 DRINK: Cook the chopped rhubarb and 1/2 cup of the simple syrup in the sauce pan over low heat until softened, about 5 minutes. Cool. 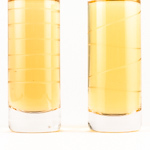 Combine the rhubarb mixture with the tequila, Grand Marnier, and ice in the blender and blend until smooth. Pour into glasses and garnish each with a basil or mint leaf. Prep time includes time to make the simple syrup. I recommend making it a day or two ahead so it has time to chill. what an innovative way to use rhubarb! MMMMMMM…I love anything with rhubarb in it! This is no exception! I just love your drink ideas! you’re a life saver! i was going to make tamarind margaritas this weekend, but can’t find reliable recipe anywhere, there’s rhubarb in the fridge, so that’s what i’ll make instead! love the idea and i am sure they’ll be delicious! what a way to celebrate my 5-year blogoversary! Johanna, congrats on your blogoversary! I hope you enjoy the rhubarb margaritas! Lovely, lovely! Bookmarked for a Cinco de Mayo party next week! Homegrown rhubarb? Wow, what a treat!! This looks so tasty. Summer here we come! A rhubarb margarita sounds perfect for Spring/Summer. I’ll have to pick some rhubarb this weekend and give it a try.